﻿ Iberotel Luxor Luxor. JIMAT di Agoda.com! Ada soalan mengenai Iberotel Luxor? Direka untuk kedua-dua tujuan perniagaan dan percutian, Iberotel Luxor terletak di lokasi strategik di Pusat Bandar Luxor; salah satu kawasan yang paling popular di bandar tersebut. Dari sini, tetamu boleh menikmati semua kemudahan yang bandar ini tawarkan. Penginapan ini berada di sekitar kawasan tarikan bandar yang popular seperti Jolleys Travel & Tours, Sherif Tours, Magic Horizons. Ambil kesempatan daripada pelbagai perkhidmatan dan kemudahan yang tiada tandingan di hotel Luxor. Pilihan kemudahan kelas atasan seperti khidmat bilik 24 jam, khidmat bilik, restoran, khidmat dobi, penjaga pintu boleh dinikmati di hotel. Masuklah ke salah satu dari 185 bilik tetamu kami dan tenangkan hati anda dengan pelbagai kemudahan seperti ruang tamu asing, bilik larangan merokok, penyaman udara, panggilan kejut, meja yang boleh didapati di beberapa bilik terpilih. Di samping itu, pihak hotel menawarkan aktiviti rekreasi untuk memastikan anda mempunyai perkara untuk dilakukan sepanjang penginapan anda. Iberotel Luxor adalah destinasi sehenti anda bagi penginapan hotel berkualiti di Luxor. The hotel is located on the East Bank. A 900m walk to Luxor temple and the Ferry to the West Bank. Karnak is 3,5km away but is also a nice and peaceful walk once you pass Luxor temple. The breakfast was pretty decent; the coffee rolls are great and there’s a chef making eggs the way you like them. The one thing that we didn’t like was the noise at night in the lobby. Try to get a room not facing the lobby because you’ll be guaranteed to wake up at least twice a night to loud noises. Price/quality is good. First of all, the front office staff was very rude. Never let client finish talking always cut in the middle. For the example, I was asking where the elevator is, she answered toilet is there before I finished my question. I was asking where the breakfast will be, she answered taxi is outside before I finished my question. The the check in process is soooooooooooo long, and ended by throwing a keycard on the counter. After checked in, my room’s hair dryer was not functional. Put all together we went to complain to the hotel management, and got room reassigned, then we realized the previous room didn’t even have basic amenities (coz our reassigned room had). This hotel’s front office is not even an one star hotel’s front office. Too rude too cold, like everyone checking in is an enemy. But the hotel residence manager is super good and professional. Hotel’s food and beverage is also good. But I will for sure not recommend this hotel to anyone. Hotel is located in the water front close to the old town and the railway and bus station. just in the water front front nice view with floating pool. An excellent hotel and fantastic value for money. I was given a splendid suite of rooms - comfortable lounge, spacious bedroom, clean bathroom. Really nice out the back towards the river - very good swimming pool. Staff are pretty good. Unfortunately there is a small army of unpleasant people camped outside the hotel ready to hassle and harrass (the same is true all over Luxor, probably). But deal with these then I think you'll have a great stay at this friendly, well-organised hotel. Wasn't impressed with the one evening meal I had at the hotel, but the breakfasts were spot-on. Excellent value for the money, stayed there couple of nights and would definitely return back. Most attractions within walking distance. Very quiet but central location; lovely garden and great swimming pool on the Nile bench; very clean and big room with big bathroom;efficient and attentive staff; the only misunderstanding and unpleasant surprise- on their web site the room is called "with the garden view" which unfortunately means the small balcony facing the in-building, roofed patio where are the reception and lobby located; we wouldn't have minded if the space was not covered by plastic ugly roof and there were no fresh air; the info should be more clearly explained. Anyway the hotel is very good! After staying in Cairo & Aswan, I was finally feeling relaxed once I stepped into this hotel. As a single gal traveller (Chinese gal) - I felt harassed everywhere - guess not many Asian single travelers in Egypt!! Feeling secure & at ease was just what I needed!!! Staff there seem more flexible & smart- after talking to people in Luxor - major difference is that it's a town all about tourism! And indeed, wandering ard town, guys still came up selling you cruises, or asked "what's ur name?" - but none was as pushy as elsewhere!! So I dared to walk around Luxor alone at night, though still not highly advised if you are off the main streets, of coz! I got a room facing Nile - must request! As they have other rooms facing the inside of the hotel with no balcony - that would be gloomy!!!! Anyhow - I woke up for the tour during daybreak and saw across hot air balloons flying towards the not yet descended moon - it was just awesome, ESP it's above the Nile!!!! :))) Highly recommend here!! Their restaurants don't serve much Egyptian cuisine! we booked 3 superior rooms for 2 days. 1 room had a strong cigarette smell, we informed the reception about it and they sprayed something to make the smell go away. rooms: for a 4 star hotel standard in luxor the room size was reasonable. beds were comfortable, linens were clean. bathroom was small but well maintained countertops, toilet and shower stall, though shower stall/tub would be rather tight for a large person of above 100kg. we got rooms with half nile view and half street view, it was some noise from the traffic on the street but you can still sleep soundly, i think that if it was during peak season it could be more noisy. luxor is still recovering from the revolution in egypt at the time of our visit. hotel: hotel entrance from the outside doesnt look too promising. however, once inside, the hotel lobby area is pleasant, fresh and clean. the hotel staff are mostly nice, except for 1 guy at the reception. but all in all i'm quite please with the service overall. there is a luggage storage room, and it is usually locked. it was nice of them to allow us to leave our luggage for a couple days. 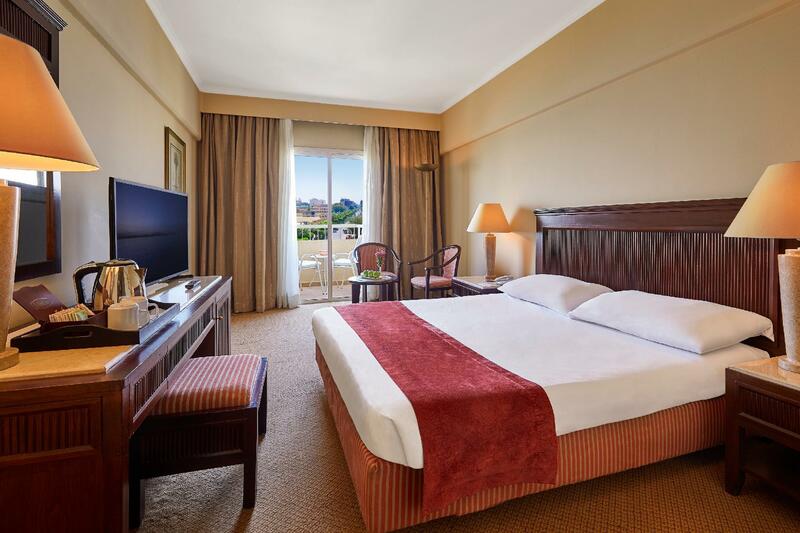 it has a nice garden in the back and a nice nile view, with ample seating in the garden area to enjoy the nile view. food: the breakfast was very good with a wide selection of choices, especially for a hotel in egypt of such a standard. there are also italian and chinese restaurants in the hotel grounds garden area, we tried the italian and it was quite ok. all in all i would definitely go back to this hotel the next time i'm in luxor. for usd 55 for a standard doubleroom it is a value for money accommodation. We stayed here for two nights. 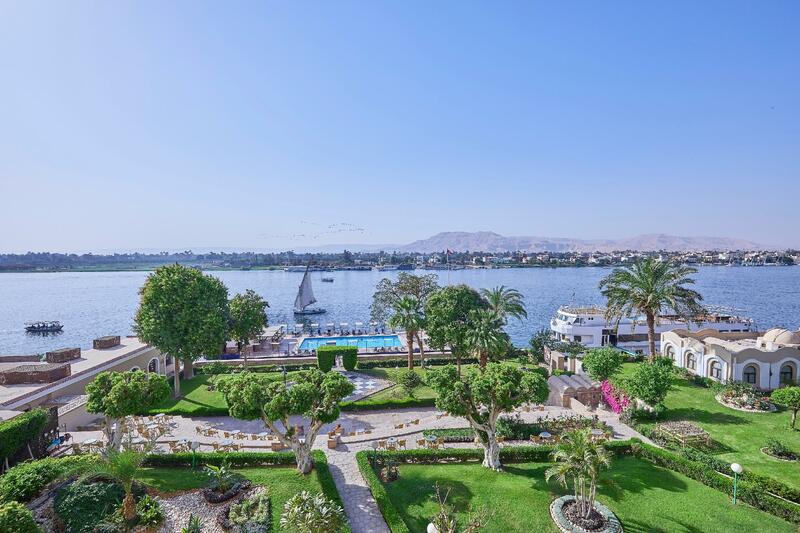 This Hotel is located right on the river NILE and its swimming pool is actually inside Nile on a boat. Luxor is a small city with very low traffic. You can visit the city by paying 3 or 4 Egyptian Pounds to a horse-driven trolly. Beware of taxi drivers as they charge too much for smaller distances. This hotel rocks. Friendly and accommodating staff. Great breakfast, walking distance to most site seeing eg. Luxor temple, market, museum. We made a mistake with our booking and they changed without a penalty and gave us a fantastic room. Try the Chinese restaurant good food with reasonable prices. I stay there for 3 nights. Try to get higher floor to get better nile view. It's worth to stay here. Bathroom is quite small but still good. Mandarin Chinese Restaurant has good food. You should try that. Nice breakfast if you don't have time to get breakfast you can ask for breakfast box in advance. 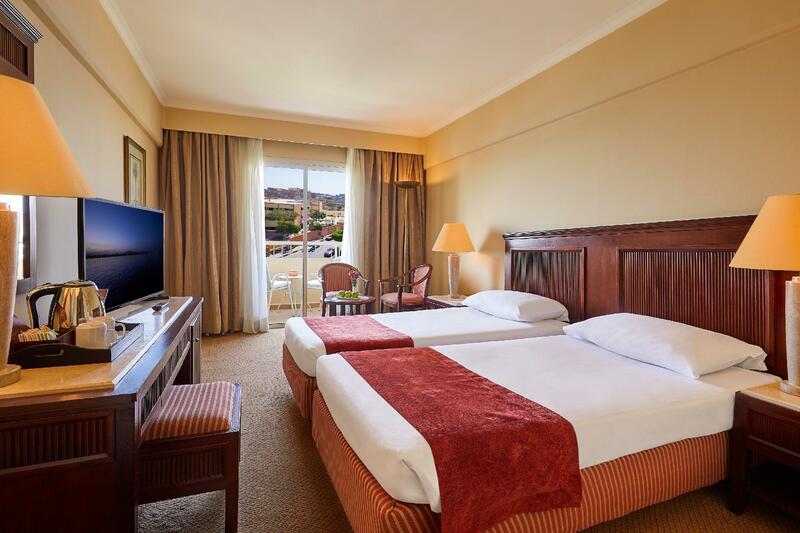 A really professional hotel with all the facilities you need - located right on the Nile River boasting comfortbale rooms, great pool that is on a barge on the Nile river and helpful staff. It isn't a bad location but has everything you might need within 500 metres. Also has a HSBC bank next door. Teh staff will try to sell you tours they are connected to, but only if you ask. You do not get hassled. I suggest looking outside for cheaper tours. Excelent location (5 minutes walking to the Luxor Temple), service and breakfast, the swiming pool is a truly relief of the unbereable heat. This hotel is perfect, except for the extremely high price of internet. The swiming pool is floating over the nile over a big boat. The buffet breakfast is delicious and you can have it seeing the nile and the swiming pool. You can have luch, dinner or a drink in a differents restaurants inside the hotel. The Iberotel was a great place to base out of while in Luxor. The location is perfect, the rooms are very comfortable, and the staff were very nice. The floating pool on the Nile was a nice touch. We got a great deal in May, through an online booking so the value for the money was amazing. If ever we are back in Luxor, we will not hesitate to stay at this hotel again.